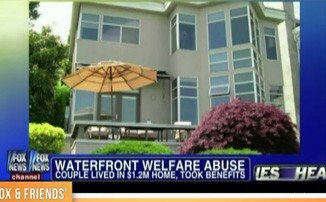 One couple that had been collecting welfare while living in a luxurious waterfront home would appear to have just learned an important lesson: Don't mess with Uncle Sam. The two Seattle residents drew widespread media attention last year after reports emerged that they had been collecting housing vouchers, food stamps and monthly cash stipends while living in a $1.2 million house. Now they may pay a hefty price for lining their pockets with taxpayers' money: David Silverstein and Lyudmila Shimonova face up to 10 years in prison and must pay at least $500,000 in fines, after pleading guilty Thursday to theft of government funds, Seattle news outlets are reporting. In November of last year, federal agents raided the waterfront Lake Washington home where the two were living, to put a stop to their scheme. KING-TV in Seattle reported that the woman had been receiving a staggering amount of aid for someone living in a luxury home: more than $1,200 a month in housing vouchers, food stamps and cash from federal and state governments for a disability. The pair had managed to qualify for the money by lying on applications at least seven times over the years, The Seattle Times reports. They reportedly accepted more than $135,000-worth of housing aid, in addition to other assistance. One reason that the pair was able to avoid detection is that the welfare programs that they exploited do not review the financial implications of a person's address, which Shimonova accurately recorded on her applications. Nationally, home prices are projected to decline 4 percent by the end of this year, according to Fiserv Case-Shiller’s latest projections. The country’s largest population centers will not escape this fate. In fact, in all but 50 of the 384 largest metropolitan areas examined, home prices are projected to decline for at least another 12 months before they start improving. Among the 50 fortunate regions bucking the national trend, the gains will likely be modest. Only in nine cities home values are projected to grow by more than 3%, and the largest increase is estimated at just 4.3%. These nine metro areas, with only a few exceptions, are also projected to have the largest increases in home prices in 2013. David Stiff, chief economist at Fiserv Case-Shiller, told 24/7 Wall St. that the nation’s housing recovery is not expected to reach full swing until the end of next year — even in the areas that are currently leading the country in recovery. Click through the gallery for a look at the nine cities that are bouncing back the fastest. Home prices in Danville fell 6.1 percent from their peak in the first quarter of 2009. Compared to most cities, this decline is relatively small. The Danville metropolitan area is home to just over 100,000 people, making it among the least populated regions in the country. After a year in which home prices did not increase or decrease -- between the fourth quarter of 2010 and the fourth quarter of 2011 -- home prices in the city are now expected to rise by 3.3 percent by the end of this year -- one of the largest increases in the country. See homes for sale in Danville, Va.
See rentals in Danville, Va.
Home prices in the Kennewick-Pasco-Richland, Washington metro area were barely touched by the recession. Realestate values didn’t peak until the third quarter of 2010 and are only down 1.8 percent since that period. Fiserv projects home prices will increase 3.6 percent in the region through the end of this year. By the end of 2013, values are expected to increase an additional 3.8 percent. See homes for sale in Kennewick, Wash.
See homes for sale in Pasco, Wash.
See homes for sale in Richland, Wash.
See rentals in Kennewick, Wash.
See rentals in Pasco, Wash.
See rentals in Richland, Wash. The Lewiston metropolitan area, which has the second-smallest population in the country, is projected to undergo its first improvement in housing prices since 2009 in the coming year -- an increase of 3.6 percent. In the following year, home prices are expected to increase 6.2 percent. This is within the top eighth of largest increases for next year. Between the fourth quarter of 2011 and the fourth quarter of 2016, home prices in the Lewiston housing market are expected to increase an average of 3.7 percent each year. See homes for sale in Lewiston, Idaho. See rentals in Lewiston, Idaho. From their peak in the second quarter of 2007, home prices in the Eugene-Springfield region fell 21.2 percent during the recession, putting it in the top third for the biggest declines in the country. In the last year alone, prices fell nearly 6 percent, the 40th worst decline in the country. However, Fiserv projects the region has hit its trough. Through the fourth quarter of this year, home prices are expected to increase 3.8 percent. Between the end of this year and the end of 2013, they will go up an additional 8.3 percent. See homes for sale in Eugene, Ore.
See homes for sale in Springfield, Ore.
See rentals in Eugene, Ore.
See rentals in Springfield, Ore. Between the fourth quarters of 2010 and 2011, home prices in the Hagerstown-Martinsburg metropolitan area dropped 6.7 percent -- among the largest decreases in the nation for that period. From their peak in the first quarter of 2007, prices have dropped a total 32.1 percent -- more than most markets. However, in the coming year, home prices are expected to increase 3.8 percent. In the year after that, they are projected to grow an additional 3.9 percent. See homes for sale in Hagerstown, Md. See homes for sale in Martinsburg, W.Va.
See rentals in Hagerstown, Md. See rentals in Martinsburg, W.Va.
Coeur d’Alene, located in northern Idaho, is one of the smallest and most remote metropolitan areas in the country, with a population of just over 140,000 residents. It is, however, located next to much larger Spokane, Wash. Home prices in the region fell 27.1 percent during the recession, from their peak in the third quarter of 2007. In the past three years alone, prices fell more than 8 percent each year. The area is projected to experience a substantial housing recovery over the next half-decade. Between the end of 2011 and the end of 2016, Fiserv estimates that home prices will increase 4.5 percent each year. See homes for sale in Coeur d'Alene, Idaho. See rentals in Coeur d'Alene, Idaho. Medford, Ore., is a relatively poor metropolitan area, with a median family income of $49,700 -- compared to the national median income of $63,000. The drop in home prices -- a decrease of 37.1 percent since 2006 -- has therefore been all the more painful on residents. Fortunately, home prices are projected to increase 4.2 percent in the next year. In the year after that, prices are expected to increase another 15.3 percent — the third-largest increase in the country. See homes for sale in Medford, Ore.
See rentals in Medford, Ore.
Home prices in Glens Falls, N.Y., declined only moderately during the housing crisis. Homes lost 7 percent of their value from their peak, much lower compared to a 34.2 percent average decline nationwide. Still, the 2.4 percent drop per year between the end of 2008 and 2011 was apparently enough for investors to identify the region as a potential investment. The regional economy remains stable, with an unemployment rate of 7.5 percent, well below the national average. Fiserv projects home prices in the area to increase 4.2 percent by the end of this year and increase by an average of 7.2 percent per year by the end of 2016. See homes for sale in Glens Falls N.Y.
See rentals in Glens Falls N.Y.
Home prices in the Madera-Chowchilla metropolitan area are projected to increase 4.3 percent from the fourth quarter of 2011 to the fourth quarter of 2012. The following year, prices are expected to increase another 16.5 percent -- the highest rate in the U.S. However, these improvements come after the region experienced among the worst effects of the housing crash. From the time Madera’s home prices peaked in the third quarter of 2006 to the fourth quarter of 2011, they dropped 53.1%. This is one of the largest drops in the country. See homes for sale in Madera, Calif.
See homes for sale in Chowchilla, Calif.
See rentals in Madera, Calif.
See rentals in Chowchilla, Calif.